You do very fine job. What do you think of star-line brass.? ET-Ret wrote: You do very fine job. What do you think of star-line brass.? For rifle, I am using Hornady Cases. Nothing like making good use of a new-to-me label printer. This is the same sort of label used for shipping, so it's very fade, chemical, and heat resistant. Best part is that I don't need to worry about my poor penmanship. All I need to do is scan the barcode on my phone, and I have all the load data I need for that particular box of ammo. I just relabeled all of the boxes of loaded ammo I have. So much cleaner. sjfcontrol wrote: Got a link to that? These aren't exactly cheap new, apparently. https://www.zebra.com/us/en/support-dow ... c420t.html. You'll still need ribbon and labels on top of that. There is a cheaper version that is a direct thermal printer (no ribbon), but those use the same method to print as those receipt machines at a retail store, so they will easily fade over time. The thermal transfer is what you're looking for. I got mine from a business that was getting rid of them for a very reasonable price. It came with half a roll of 4 inch ribbon and 4x3 labels. I decided rather than buying new labels, I just use the ones that came with it, then cut them in quarters. Basically 4 labels per sheet. I used a free program from the Zebra website to design the labels. Although you can use any program you want, really. Even MS Word. But to create the barcodes it's best to use a program specifically for label printers. EDIT: Amazon sells the printer for $300 new. Link to it doesn't work, though. you can get a Dymo printer for under $100. PBratton wrote: you can get a Dymo printer for under $100. The best label printers are Brother P-touch. The labels will never fade and will stay put. They are laminated when they come out of the printer and will stay where you put them. I worked in telecommunications for 20 years and they were the only label most companies would allow. If you get one of the printers that have a USB interface and use the widest label tape, you can use your PC to format your labels any way you wish. Pawpaw wrote: The best label printers are Brother P-touch. Good point! I have one of those, too —but have never tried to hook it to a computer. I’ll have to see if I can find the cable. Unfortunately I think it’s old enough it is probably a serial i/f. I just primered 100 cases of 40s. Soon, will be loaded on Turret Press. Excellent idea, Pawpaw. With a 1" label, you can squeeze in a quite a bit of info. And supposedly the Brother software will allow you to print barcodes too, including PDF417 (what I use). If I didn't need my label printer for other things like printing shipping labels, I think I would have gone for the P-touch bigger instead. I have a smaller one (half inch) for labeling around the house, and they are top notch. Shoulda sprung for the bigger one. Oh well. Club president gave me 4000 rounds of 40 S & W nickle and another club member gave me 1500 rounds of brass. I cleaned, deprimmed and loaded 500 rounds. I've been on a mission the last few weeks working with cast/gas checked bullets (both rifle powders and pistol powders) for my old Marlin 336 30-30. I still love the straight wall revolver/carbine loading (considerably less love for the bottom feeders), but have gotten intrigued by the cast 30-30 loads. Loading them is still almost as fun as shooting them, even when the stats tickle you after going through the chrony or when making small groups on the target. I wish I hadn't waited until near retirement age to start re-loading. well, since the reloading sub-forum has been quiet for several weeks, I'll add again. My old 336 has been taken out of action for a couple of weeks while waiting to get a new firing pin. It's back so I finally got it back on the range to run some more cast bullets through the chrony. 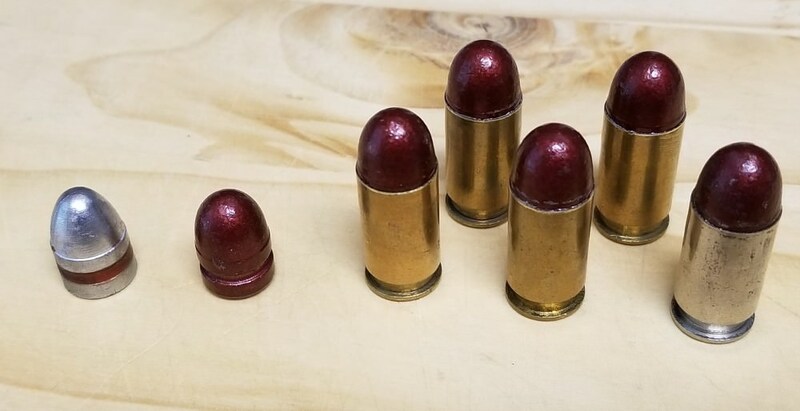 I've been on a hunt for both light loads and heavy bone crushing loads with the cast bullets (30-30 Win), and have experimented with some high quality 173 gr gc and 183 gr gc bullets from internet buddies from around the country, and some lightweight 142 gr gc (from a 150 gr mold) that were made by a local buddy. I had loaded a couple of test rounds last week to run the lightweights and the heavies and finally had the gun in my hands a went to the range this afternoon to see how things went. First, the new firing pin did it's thing well. The light loads were the 142 gr cast LRNFP GC (locally cast) and 9.0 gr of just plain old Unique. Mixed brass, CCI 200 LR primers, 2.44 COAL. This was my 4th or 5th time running this load through the chrony on a 50 yard target and have had the same results every time. Ave velocity 1472 fps, extreme spread of 33 fps, and a target group of 0.9" (1.8 MOA). With a muzzle energy of 684 fpe it would be "adequate" for 50 yards or so for small/medium game, but really not much more than from a .357 (if that much). But, it's sure a fun and accurate load .... and inexpensive on using pistol powder. The heavy loads I tested today, also loaded last week, were 183 gr cast RNFP GC bullets from a friend in Wyoming. They were loaded over a start load of 29.4 gr of IMR 4895. This was my first test of the 183 gr bullets, so the next bump up, or two, will most likely see an improvement. With ten rounds through the chrony they averaged 1949 fps, extreme spread 52 fps, and muzzle energy of 1544 fpe. Quite the difference from the "light loads" comparing velocity and energy. But, accuracy wasn't near what the old 336 is capable of. The ten shot group on target was 2.2" spread, which would be 4.4 MOA. I have no doubt it will get better along the way, and I do have other powders to work with. Since I still have another 100+ of these particular bullets the load testing can continue for a short time. But, when they're gone ... they're gone. Time to find a substitute commercial bullet - then start over. Replaced my dead Franklin Arsenal case-tumbler with another one - after 7 years' worth of service, I can't begrudge the replacement. 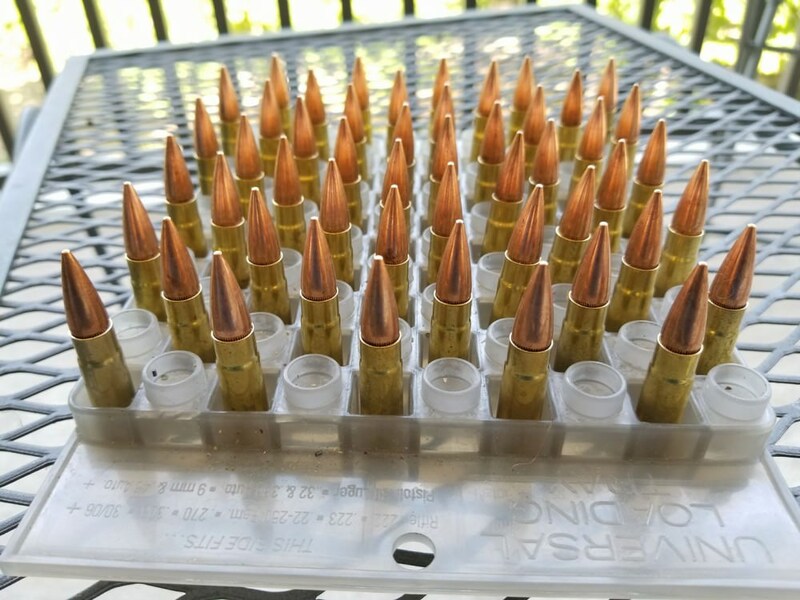 I got to test-shoot 50 rounds of Bayou Bullets' 230gr RN coated bullets in .45 to see how they work; I'd bought a box of 500 to play with, thinking that if they do work decently I'd 1) load up 400 to shoot on the Active Shooter course in June and 2) look more deeply into coating my own cast bullets. I was decently impressed so I think I'll be doing both; these bullets shoot very clean and almost no smoke, compared to heavy smoke from my usual lube seen around the first bullet below.